I just came back from a 4-day watercolor workshop with Chien Chung-Wei, in Vancouver, BC. What an experience. Phew! I’m going to be sharing photos, paintings (both mine and Chien’s), and insights from the workshop over the next few posts. So, who is this crazy guy? Chien Chung-Wei is a Taiwanese watercolorist that I discovered on Facebook last winter, where he posts regularly. 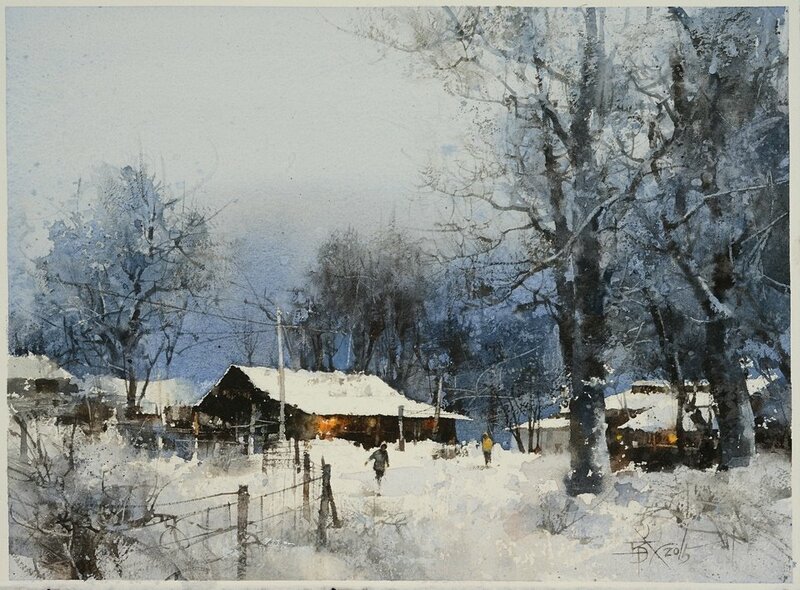 His paintings have this wonderful loose, dry brush quality to them that attracted me. They seem very detailed, but when you get closer you see he's suggesting more than he's stating. There’s a wonderful balance there. When he shared a post outlining how we could buy his book from a Taiwanese bookstore, I jumped through the necessary hoops and got it imported. While I was getting a subscription to the Art of Watercolor magazine back in March, I discovered he was featured in a number of back issues (#12 and #17), and ordered them as well. So… yeah…. you could say I was ready for the opportunity when I discovered he was doing a workshop in Vancouver with Janice Blore’s artscapes. Chien began things with an excellent, very well prepared slideshow that laid out his 10 basic principles of design. There were lots of marked up images of paintings to illustrate his ideas. I’ll go over this in more detail in the next post—there’s enough there to fill a post in and of itself. This went for over 2+ hours with a few breaks, but it was really, exceptionally engaging. It was as much about understanding art as it was about making it. And I mean that as a high compliment. After that, he spoke at length about the value of learning from masters. "Just paint, just paint, just paint…” he said. “This is true, but only because you are training yourself to see beauty, to create beauty. You must also learn. Behind me are all the masters, because I am learning from them. Life is short, so you must learn from others. You cannot just paint by yourself. …You must have beauty of thought (as well as brush).” What was even more impressive was that Chien followed it up with a really interesting activity. Instead of spending the afternoon painting a new painting, he took an older painting of his and, following the principles he’d gone over in the morning’s lecture, he abstracted it out on a new sheet, working on the composition in reverse to find “the soul of the painting”, as he said. Holding his pencil gently under his hand with his fingertips, he took “the line for a walk”, loosely moving it around with the tip while very rarely leaving the surface. “I don't care if my pencil lines show, because my lines are alive,” he said. “If they are alive, they are beautiful.” From there, he focused on planes, shading, and values, preserving whites where needed, making darks elsewhere, but never really getting too specific. It wasn’t a drawing, per se. Almost like a doodle, with a lot of thought behind it. From there, he began an abstract painting. What was so fascinating was that the painting, in the end, didn’t have much to do with the original, except for the essential bones of the composition. How was it balanced? Where was the focal point? Where were your darks and lights? Etc. It was really fun to see him work the image, and very instructive to try it myself. You can see the simple abstract sketch, and the first wash on the abstract. details emerge- linework and dry brush work, etc. The final result still has the basic design of the original- the darks, the highlights, the focal point, etc. but is an abstract. Here's the original again, for quick comparisons. His advice was to get a big book, find paintings by painters you love, and do an abstract sketch (not the painting per se, but the sketch) like this every day. His big suggestions? J.M.W. Turner, Winslow Homer, and Cotman, though I’m sure the heart of the matter is to find painters you yourself admire, and figure out what makes their paintings “tick”. What was even better was that all week long he referenced both that original lecture and the abstract painting process. It wasn’t done for giggles- it was a learning tool that he introduced at the beginning of the workshop so we could build on it. And that attention to detail was the flavor of the whole workshop. Love it. In the next post, I’ll be going over the elements of design Chien focused on, as well as some of his technique. It was, in my opinion, the real heart of the workshop.